From the weird, caviar-like umibudo 海葡萄 to the sweet, creamy kakigōri かき氷, Japanese cuisine offers unexpected flavors and textures most Americans haven't tried before. But whether you grew up with them or stumble across them in your travels, most Japanese foods are worth tasting at least once. 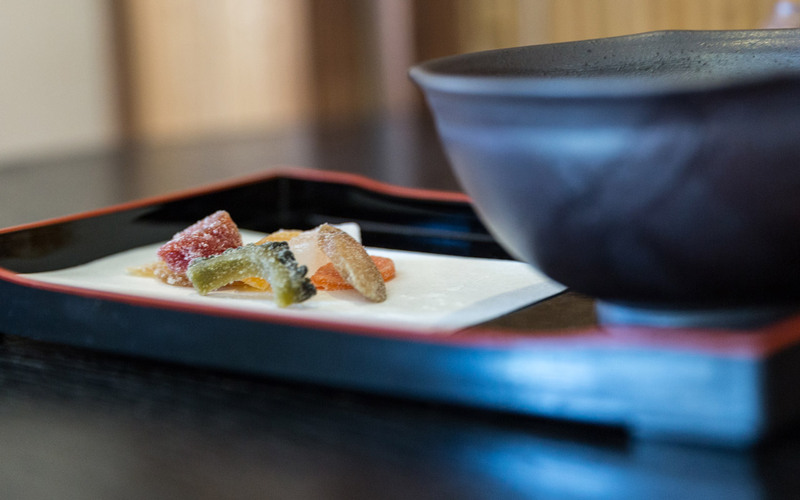 While candied vegetables didn't originate in Japan, Japanese confectioners have perfected them into a pretty serious delicacy. Candied… vegetables? You probably wouldn't expect such a combination to be delicate and refined, let alone delicious. But stick with us. To start with, they're beautiful, appearing like veggie sticks or slices, but with a white sugar glaze that makes them shine and sparkle like gems in a jewelry box. And they taste even better! Here's the story. 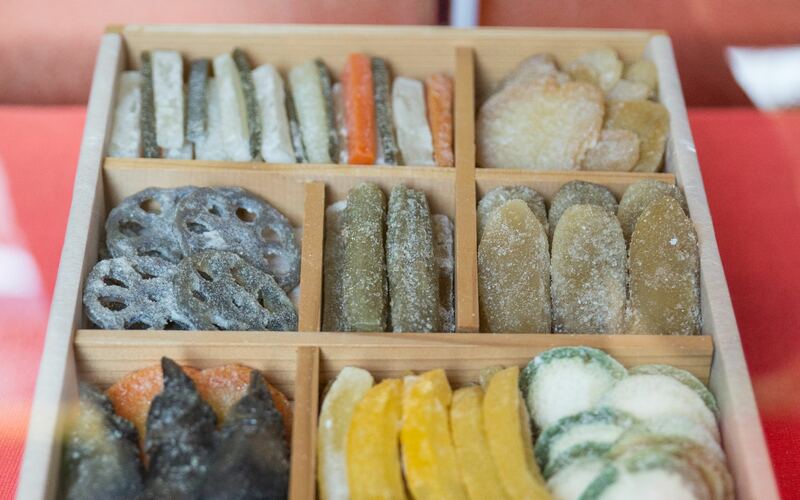 In Japan, candied vegetables are called "Edo satōzuke" (江戸砂糖漬け), which means "Edo-style sugar pickles." The process for making and cooking them is very, very slow—it can take days—and requires a lot of attention. This method preserves the flavor of each ingredient to its fullest. 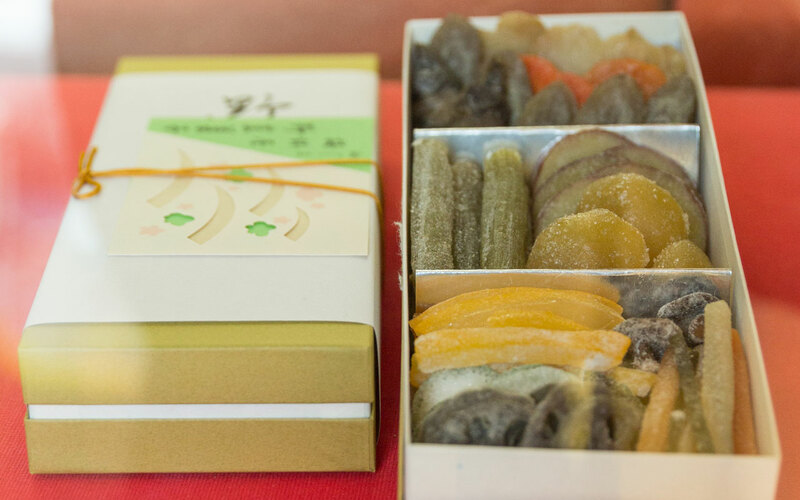 And Umebachiya is the only shop in Tokyo that still makes candied vegetables in the authentic Japanese style. To be honest, none of us had high expectations for candied vegetables. Mami had found a reference to Umebachiya while searching for unique omiyage in Tokyo, but there weren't many reviews or sites with much information. Would sugar-coated burdock root or sugared bitter melon actually taste good? Hmm. We weren't sure, so we decided to check it out. To get there, we took the subway to Keisei Hikifune Station, one station from Tokyo Skytree, and walked for about ten minutes through a residential neighborhood. 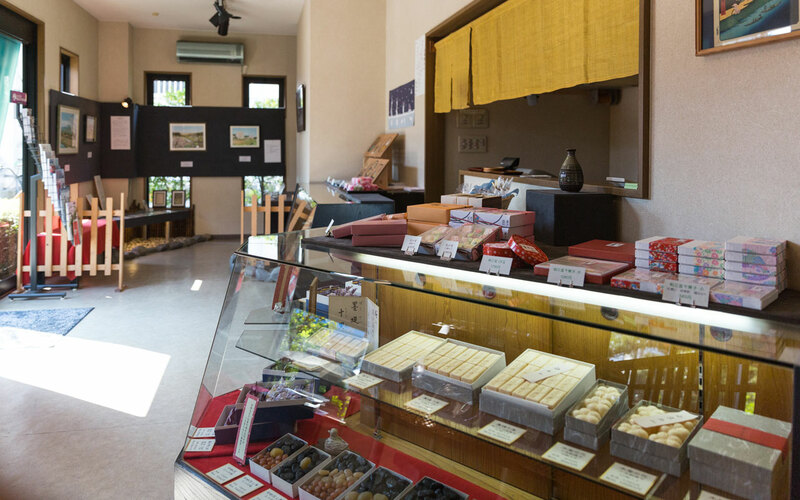 Umebachiya was a clean, neat, traditional Japanese sweets shop with a little souvenir section and a Japanese-style café. 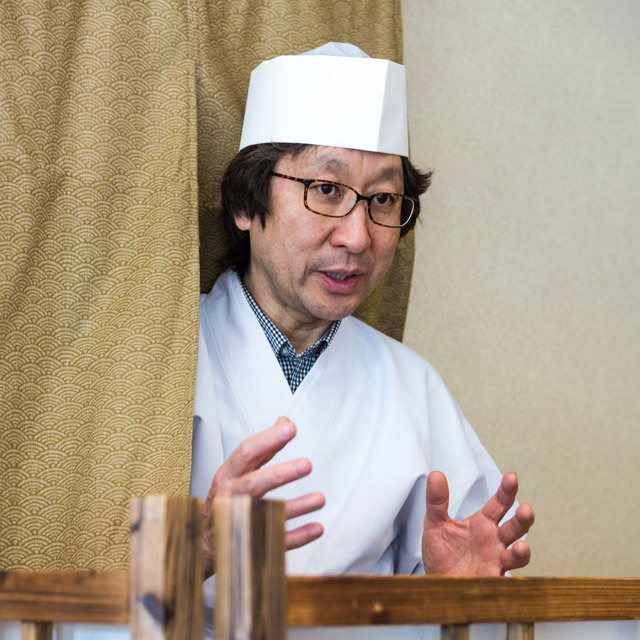 As we entered, the store's third-generation owner, Maruyama Soichi, came out from behind a noren 暖簾 curtain to greet us. Although Maruyama-san is the only remaining artisan of Edo satōzuke, and has more than thirty years of experience, there wasn't an ounce of haughtiness in him. Instead, he had a gentle manner, smiling and greeting us politely. "Thank you for coming all the way to Umebachiya!" he said with a bow. We were guided to a table in the café area, where a waitress served us hot tea. We explained to Maruyama that we'd like to try the candied veggies before asking any questions, and he agreed, suggesting we try the shop's most popular item: an assortment of several candied vegetables with matcha. We learned later that visitors can normally pick out the selection themselves, and that the sampler costs ¥648, including tax. But we chose to let Maruyama pick them for us the first time. Soon Maruyama returned with a beautiful array of candied vegetables arranged on a tray. We took a photo of his selection: at the very front (bottom) is gōyā ゴーヤ (bitter melon); the furthest to the right is gobō 牛蒡 (burdock root); the second from the right is carrot; then daikon radish; the skin of bitter summer mandarin; tomato (the red rounded one), and ginger (hiding behind it). 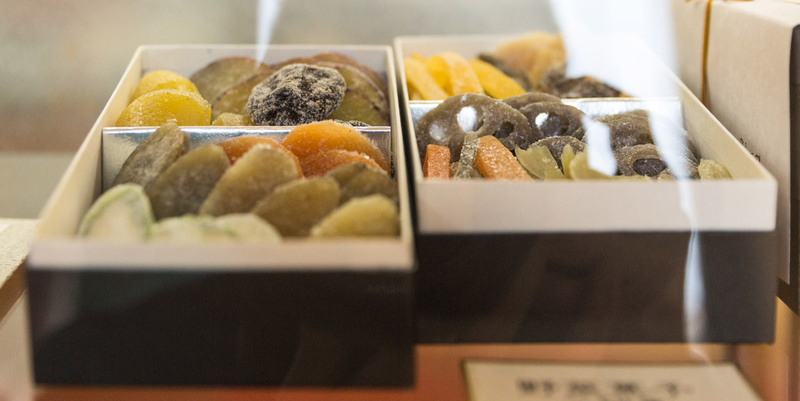 Umebachiya is the only shop in Tokyo that still makes candied vegetables in the authentic Japanese style. It looked beautiful. Koichi pointed to the tomato. "This kind of looks like an umeboshi 梅干し (salted plum)," he said. Maruyama chuckled, "Yes it does, but it's a cherry tomato. You can taste a little sourness in it." "And this is goya, right? Can it really transition to sweet from bitter?" "All of them can become sweet," he said, "though goya has a subtle, lingering bitterness for an aftertaste." Before we dived in, our host took a few moments to explain the cooking process, and how he creates each candy according to the vegetable's original taste and qualities. Rather than just a ball of sugar, each confection is comprised of the natural characteristics of its main ingredient—the carrot-ness or the goya-ness—and ordinary granulated sugar is used to balance its sweetness. 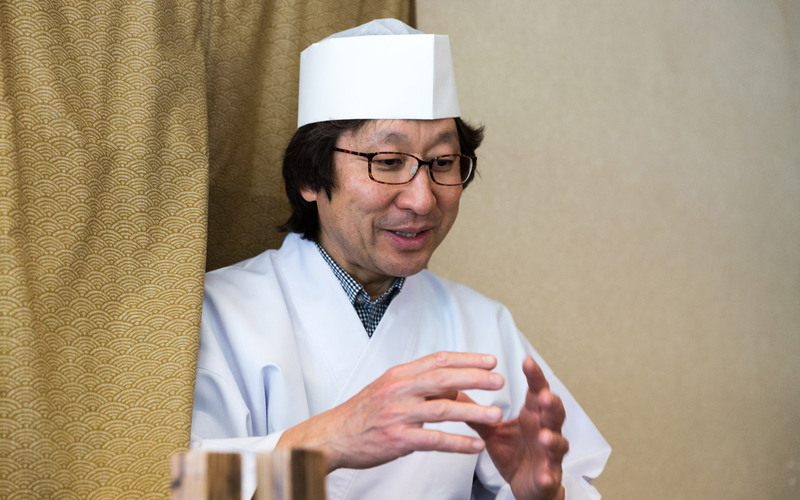 "Our candies have an elegant sweetness due to the great flavor of their ingredients," Maruyama explained. "I start with fresh vegetables, slice them, and boil them a long time, to the point just before they melt apart. Then I simmer them in sugary water, very slowly. They are so soft that I need to pay close attention so they don't start to fall apart. Depending on the ingredients, this can take from two days to a week." We all sat upright with surprise. That long? Maruyama smiled. "Yes, but this time and effort pulls out the original flavor of each ingredient really well. Try them, and you'll see what I'm talking about." "I start with fresh vegetables, slice them, and boil them a long time, to the point just before they melt apart. Then I simmer them in sugary water, very slowly… Depending on the ingredients, this can take from two days to a week." We weren't sure where to start, but decided to taste the bitter melon and cherry tomato first. After one bite—it was more of a curious nibble—there was a long pause, everyone at the table wearing the most serious faces ever by people eating candy. It wasn't as if the candies were disgusting; it was more like our taste buds were in shock. They were simply unlike anything we'd ever tasted. The first nibble was sweet, of course, because of the sugary coating, but a moment later we could taste the umami of the original ingredient—and more and more of the natural flavors coming through. It was reflective of much of Japanese cuisine, which tries to enhance or accentuate ingredients' natural flavors as much as possible. We still weren't exactly sure about the unfamiliar taste. Yet the more we nibbled, the more we grew used to it and found ourselves falling in love with this unusual, authentic delicacy. Texture-wise, each "candy" was soft and easy to eat—even the ginger, which is usually stringy—and Koichi guessed this was because of how each vegetable was sliced. But Maruyama said that was only partly correct. Besides slicing each one a particular way, he also boils the ginger at least three or four times, discarding the water as soon as it boils and starting all over again. 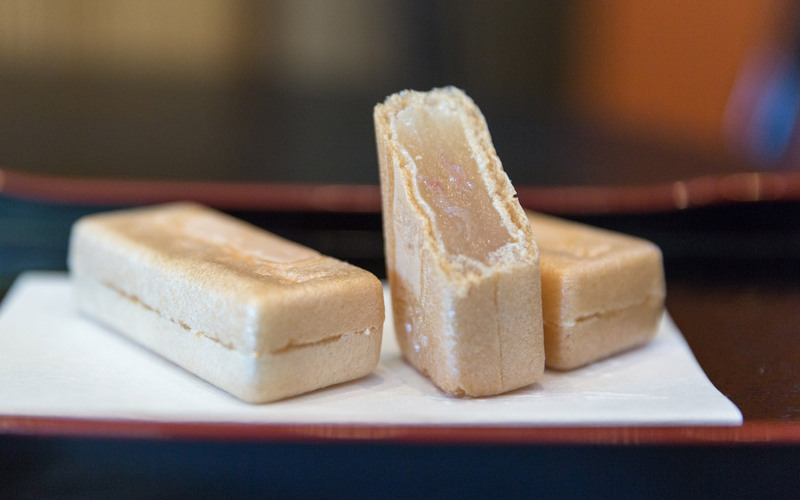 This breaks up the ginger's stringy fibers, he explained, turning each slice into a smooth-to-eat candy and weakening its spiciness, which is crucial because Japanese sweets tend to be pretty bland. The summer mandarin skin, for example, had just the right balance of aroma to flavor. The bottom line was that we were very impressed. Mami's favorite was the daikon radish, and Koichi's was the gobo; both thought its flavors were retained the best. There was some discussion about whether what we were eating was candy or food, and to this day we still can't decide. To be sure, these delicious little slices definitely tasted healthier than typical candy. When we had finished all our candies, Maruyama asked us how they were. "They were great," Mami said, happily. "We never expected something like this!" Koichi agreed, wondering aloud where the idea of slow-cooking and candying vegetables had come from. Our host told us it was a technique originally used in Chinese herbal medicine, which found its way across the Korean Peninsula and over to Japan. He said that during the Edo period (1600s to the late 1800s), Japan didn't have many fruits or vegetables, and that candying was a way to preserve the few that they had. "There were only four or five kinds of them back then," Maruyama said. "Ginger, summer orange skin, knob seaweed, and burdock root. The number of vegetables we use today has increased over time. Now we usually have fourteen or fifteen kinds." During the Edo period, Japan didn't have many fruits or vegetables, and candying was a way to preserve the few that they had. Maruyama went on to say that he is always trying out new vegetables in order to create new kinds of candies. He did his first tomato three or four years ago, and it turned out well. That isn't always the case. "Somebody asked me to try making candied garlic," he said. "While I succeeded at making it into a candy shape, it tasted absolutely disgusting! Finding a new ingredient is a continuous process of trial and error." 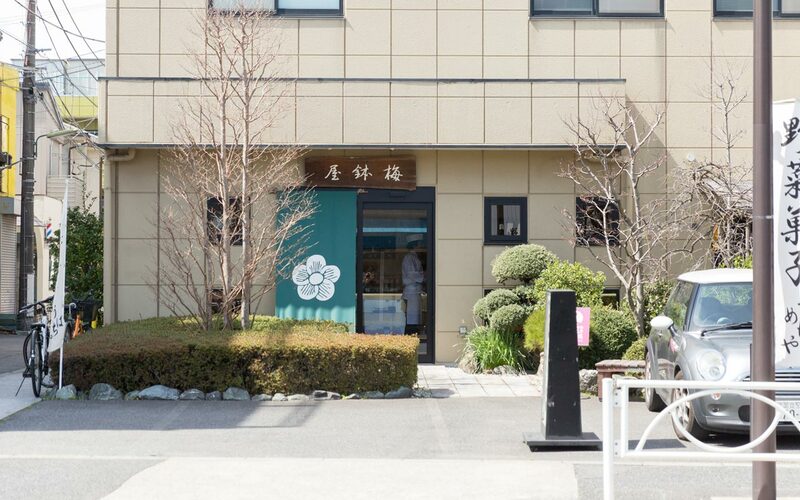 According to Maruyama, only a few shops in Japan besides Umebachiya sell candied vegetables, including the Tokyo Solamachi East Yard 5F at the TOBU Group TOURIST PLAZA Sumida Machi Dokoro, Hyakkaen Satei-Sahara, or Edo Tokyo Museum, Sumida-ku Culture Sightseeing Section. Among these, Umebachiya is the only one that uses the traditional Edo period technique. 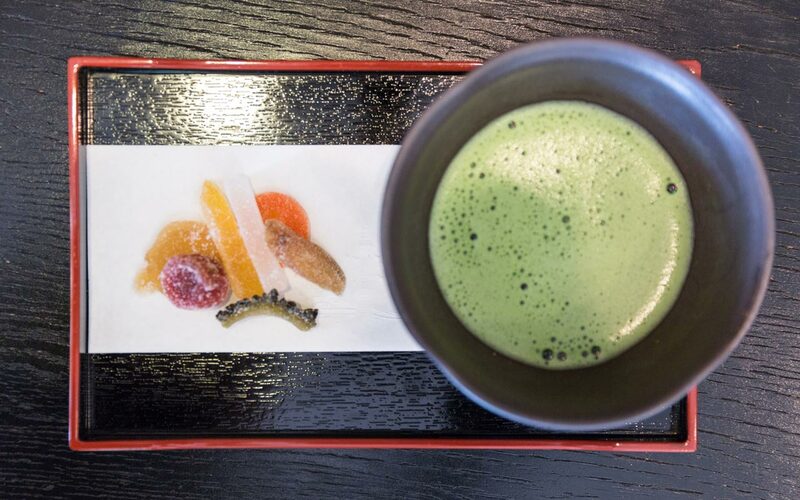 For Japanese history buffs, tasting this delicacy offers a chance to experience something people might have enjoyed in the seventeenth century. Before we left, we bought a few boxes as souvenirs to bring home. They last about two weeks at room temperature, Maruyama said, though the sugar starts to melt if it's too hot. He suggested we keep them at 20º C (68º F) or less. Unfortunately, we couldn't choose our favorite veggies for the boxes, but the shop's pre–packaged selections were interesting and beautiful. As a bonus, we also tried and loved Umebachiya's monaka 最中 (bean‐jam‐filled wafers). We ate a plum flower-shaped monaka with red bean stuffing called kigoto no hana 木毎の花, and a rectangular-shaped monaka with white kidney bean and cherry-blossom-petal stuffing called bokutei jūri 墨堤十里. 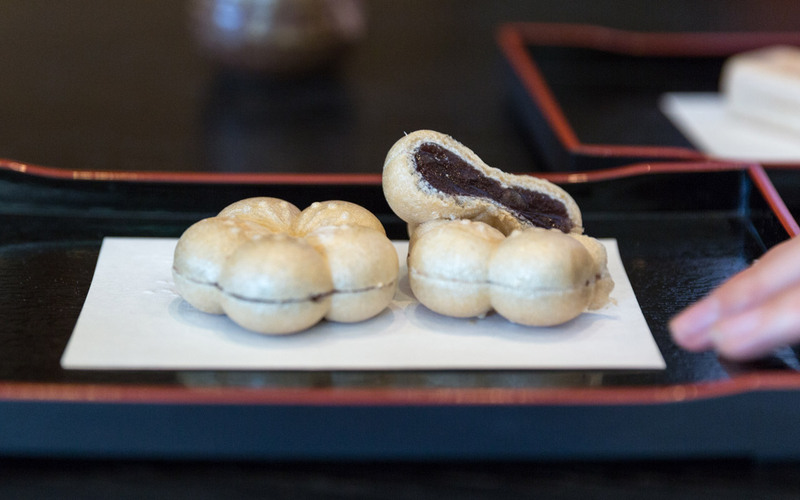 The red stuffing uses smooth azuki 小豆 red bean paste made from whole beans cooked separately, which meant that the paste lacked the bitterness and texture of the bean skin—a nice surprise. They both had delicate and elegant sweetness and cost ¥135 apiece. Umebachiya also sells other interesting products, including amanatto 甘納豆, which means sweet natto, made of various beans; seasonal konnyaku mizuyōkan 蒟蒻水ようかん (soft sweet bean konjak jelly) called yūdachi 夕立; and, on the fifteenth of each month, candied daikon radish with grated ume plum called umewaka 梅若, which refers to the name of a boy in an ancient Japanese legend. But our first taste of their signature candied vegetables was, by itself, reason enough to seek out this quaint shop and its helpful, unpretentious owner. 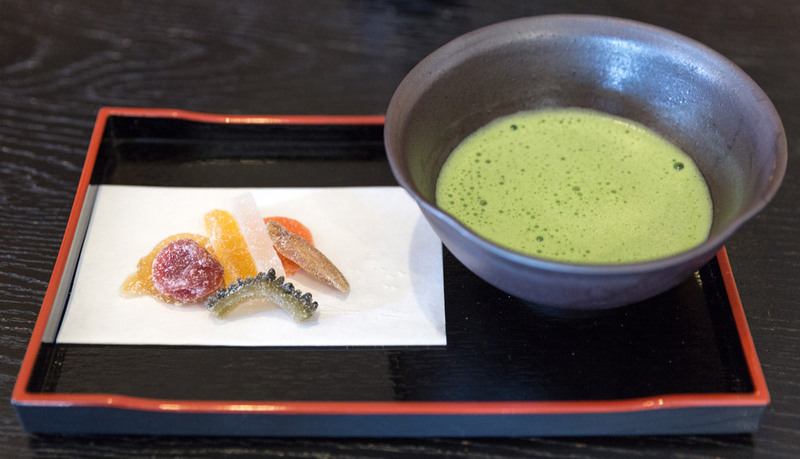 We hope you seek it out, too, and try some of these unique, Edo period sweets. It was delicious, cute, and unique. I loved it and want to eat it with some bitter matcha again. The place is a little out of the way, but I highly recommend visiting if this kind of treat is something you are into. It is obvious there is a high level of care and quality to their products. Very tasty! These were fantastic! I’m not a fan of sweets, usually, so these “sweets” were perfect for me. I particularly enjoyed the sour or bitter items, like the burdock root, eggplant, and ginger. That being said, the tomato was probably my favorite. I couldn’t stop trying different flavors and was happy with them all. Although it’s a bit out of the way, I think this is really an excellent omiyage gift to bring back home with you to give to your friends and family (or just give to yourself). You can build your own set!